We are a team of MA Curating students at the University of Essex. We are passionate about Art, how it can improve society, and how it can make changes for the better. As our final project, we are organising an exhibition about the Hong Kong Umbrella Movement, which will run from 17 May - 16 June 2018 in Art Exchange, the art gallery at our Colchester campus. 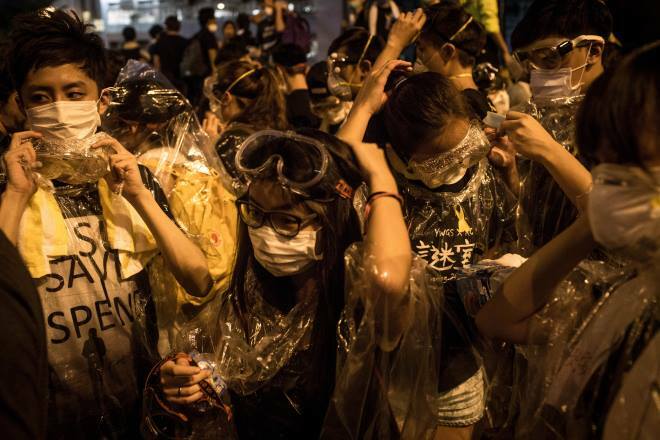 What is the Umbrella Movement? 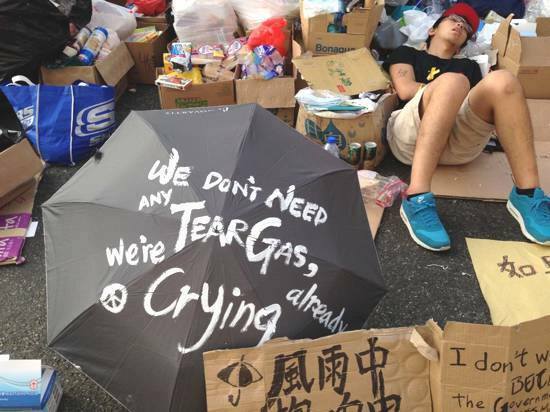 This civic protest is known here as the ‘Umbrella Movement’. Originally used by protestors to shield themselves against the police's pepper spray, the umbrella has become a powerful symbol of defiance and unity, thus giving its name to the movement. The protest itself was cleared in December 2014, but many are still campaigning for universal suffrage in Hong Kong, including Scholarism leader Joshua Wong, who has since campaigned for the pro-democracy party ‘Demosistō’ in Hong Kong. He faced arrest in 2017 and was nominated for the Nobel Peace Prize in 2018. Although many have been inspired by the courage and unity shown during the protests, general awareness about the movement in Britain seems to be limited. In this sense, our exhibition will be educational and reflective, as well as being a homage to recent events. Many of the artists who will feature in our exhibition also continue to campaign, and it is in this light that the artworks should be understood. So, What is Our Exhibition About? As students of the University, we feel a particular empathy with the important role students played during the protests. Alongside the currency of the issues at stake, this means that we believe the Umbrella Movement could not be more relevant to the audience today. In an age of undeniable political crisis in the West, we want to show that collective action is powerful, and that freedom should never be taken for granted. By displaying artworks produced during the protests, or inspired by them, we also want to increase the knowledge that audiences have of the Umbrella Movement and its implications on a broader scale. We have received the interest of several artists that participated in the original movement, giving us the opportunity to show artworks from Hong Kong first-hand. These artworks are from multiple medias; we will include photography, sculpture and video art. Kacey Wong’s sculptures deal with the alleged kidnappings of several activists by the Chinese government and the police reaction to the protests. On the other hand, different works of video art and photographs by Sampsong Wong, Chila Howard or Suki Mok portray the unity of the protesters and the hope and sense of community they embodied. But there is more. Our work will not stop in the gallery; we will bring this message to as wide an audience on campus as possible, by hosting events that encourage participation and discussion, along with a series of debates, talks, and workshops. We wish to give the audience the chance to shape our exhibition and trigger a deeper reflection about the Umbrella Movement and its ideas. We would like visitors to think about Democracy, Human Rights, Nationality and also about Art and how it can lead or highlight political stances and movements. We will provide a wall where you will be able to put those thoughts and ideas to share your own vision with the rest of us. Why are you important for us? In order to cover a part of the costs of the exhibition, we received a budget from the University's Art History department. Unfortunately, this does not allow us to carry on the project fully. Shipping artworks from Hong Kong is expensive and we want to cover the copyrights of artists' works in our exhibition. Furthermore, we would like to invite one of the artist who will be collaborating with us in the exhibition to give a talk for the public. As a major activist and artistic figure of Hong Kong's contemporary art scene, it would be a great honour and privilege for us to have him here. Thus, we need your support to make this happen! There is nothing we can say to thank you enough for supporting us! Hence, we have prepared a series of rewards and gifts to thank you for your kind support. You might even be invited to our opening night or you could receive a copy of our catalogue! But above all, you will be part of the excitement of curating an art exhibition and help us to deliver our message and our passion to wider audiences. There is more than money to help us succeed! Please share this project with anyone you think could support us – on Twitter, Facebook, LinkedIn, by email, telephone, in a chat over the fence or on your blog. To thank you for donating to our project, we will make a special "shout out" on our social media pages! To thank you for donating to our project, we will send you a personalized e-card to your personal email! To thank you for donating to our project, we will send you a special customized badge, and will give you a "shout out" on our social media pages! To thank you for donating to our project, we will send you a customized badge, a catalogue of our exhibition and will give you a special "shout out" on our social media pages! To thank you for donating to our project, we will send you a poster and a catalogue of our exhibition, and you will benefit from a private tour with one of our fellow curator! To thank you for donating to our exhibition, we will send you a personal postcard. Your name will also be included in the catalogue and you will receive a personal copy to your personal address! To thank you for donating to our project, you will receive a limited-edition print of one of the artworks. Your name will be included in the exhibition catalogue and you will receive a signed copy sent directly to your address! To thank you for donating to our project, we will give you a personal "shout out"on social media, a personalized e-card sent directly to your email, a postcard from one of our artists, and a limited-edition print. Your name will also be included in the exhibition catalogue and you will receive a signed copy sent directly to your address! Our highest reward will give you a personal "shout out"on social media, a personalized e-card sent directly to your email, a postcard from one of our artists, a unique handmade postcard and a tot bag decorated with one our our special badge. Your name will also be included in the exhibition catalogue and you will receive a signed copy sent directly to your address. We can't thank you enough!